I have seen the same stamp, with the same overprint, same cancel with same date and city name on an almost identical piece of paper. ATTENTION: these stamps were primarily issued for stamp collectors, they were only used during a very short period! 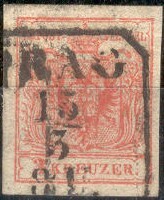 The basic stamps have watermark 'Cross' (most common) or 'Crown' (RR to RRR). A 20 h orange also exists. These stamps were issued on November 7 1918, and are also known as Scout Stamps. 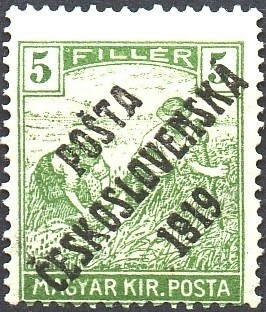 When Czechoslovakia first became a nation they had no postal carriers and used Buy Scouts to deliver the mail. These stamps were used for a very short time. Mint stamps can be found much more often than used stamps (beware of philatelic used stamps!). Used stamps have a special postmark: a roman style "N.V." in a CDS. There are excellent forgeries known of these stamps. 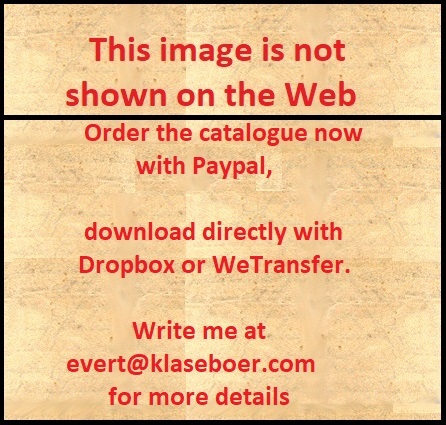 Be aware, many forgeries exist!